The R10's in their third color scheme, ivory and turquoise. Subway dirt proved this color scheme impractical. It fared better on the mostly elevated Flushing line on R36 cars. This northbound "A" train is descending from the elevated portion of the line into the subway, next stop, Grant Ave. This is the "City Line" section of Brooklyn, so named because it was on the Brooklyn-Queens border. Brooklyn was once a separate city. Most of the orders of cars delivered for the system up to the Second World War followed a basic pattern developed with the first steel cars built in 1904. Technological improvements had been made but the appearance, sounds, and "feel" were very much similar right up to the R1-9 cars which ended the first generation. In 1948 a new type car was to appear, the mechanics of which would be the progenitor for all rolling stock built for the system until 1969. The body design for these cars which became known as R-10, their contract number, had been planned for by a rebuilt R7A car which was wrecked, number 1575. The new body for that car was identical in appearance to the 400 class R10 cars which were to follow. Flourescent lighting and all-welded construction were the only concessions to modernity in the carbodies, other than a general atmosphere of the late 1930's. Air conditioning, streamlining, and stainless steel construction, which had appeared on big railroads already, would not become standard features on the New York Transit system for nearly 20 years after the R10's appeared. The familiar double hung windows were not used on these cars; larger, single drop sashes were the order of the day. The large ceiling mounted paddle fans were replaced by twice as many smaller ceiling fans about the size of a home table fan. The familiar clerestory, or monitor roof had vanished, replaced by a more rounded design which included a raised center section but had not the sharply defined lines of the clerestory roof. The big changes in the R-10's however were not where they were apparent to passengers. While the propulsion control system was already similar to that which already existed, these cars were powered by a 100 horsepower traction motor on each of four axles, whereas most older cars had two large traction motors either one per truck or both on one truck. Acceleration rate for these cars was 2.5 miles per hour per second as opposed to 1.9 MPHPS on the R19 class. The biggest change of all was in the braking system. These cars would have both pneumatic and dynamic braking, and not only a more modern brake valve but an entirely different air system. We have already discussed the automatic air brake as used on the older vehicles of the system, which is still in use on all American (and other) freight equipment today. Automatic, as we will refresh you, meant that a reduction in brake pipe pressure would bring about brake applications in varying degrees of service, or a total loss of pressure bringing an emergency application. In the R-10's the automatic feature would only be used as an emergency feature, with emergency applications resulting from loss of brake pipe air by emergency application by motorman, dead man's feature, conductor's valve, tripping at a red signal, break-in-two of train, or many other reasons which could cause loss of brake pipe air. Brake pipe pressure was increased from 70 lbs per square inch used on older equipment to a basic 110 PSI, however as low as 90 PSI would be permissible for operation of a train in passenger service. Service braking was controlled by straight air via electro-pneumatic braking. This was a throwback to the first air brake system invented by George Westinghouse, however the all-safe automatic system was kept for emergencies. As we have already discussed the electric, or electro-pneumatic brake we need not discuss it here although must mention that of course with this new type of braking that circuits would be different from that used on earlier cars. To charge the air brake pipes on these cars the brake valve would be placed in Full service; when the brake pipe was fully charged the straight air pipe would be fully charged and only then could the brakes be released by exhausting straight air pipe pressure. With no pressure in the straight air pipe brakes would be released, with increases in pressure brakes would gradually be applied. Of course, without sufficient brake pipe pressure the service brake would be inoperative and brakes would apply in emergency. Instead of having one body mounted brake cylinder as used on the older equipment, the R-10's had four truck mounted brake cylinders. This system eliminated quite a bit of brake rigging and additionally made braking equipment easier to service. The brake valve on the R10 was an ME42, with self lapping feature. Whereas on older brake valves the motorman or engineman would have to work the valve back and forth between service and lap or release and lap to gradually apply or release brakes, on a self lapping brake valve a slight movement in either direction would control brakes as desired. No big deal but apparently an easier and cheaper brake valve to maintain. In addition to the modified control systems, the inclusion of dynamic braking was the most significant improvement on the R10 and all stock to follow. Dynamic brake is not electric brake, there is no relationship between the two. There is equipment with dynamic brake that does not have electric brake and vice versa. On locomotives equipped with dynamic braking it is controlled electrically, on most examples of multiple unit electric coaches it is controlled by straight air pressure. By means of an actuator sensitive to increases or decreases in service braking via straight air pipe pressure the amount of dynamic brake amperage is regulated in this system. The traction motors, by having field polarities reversed, act as generators and serve as a brake by retarding motor speed, thence thru the gearing the speed of the axles is reduced and train speed reduced. The beauty of this sytem is that brake shoe wear is reduced tremendously and therefore maintenance costs reduced. 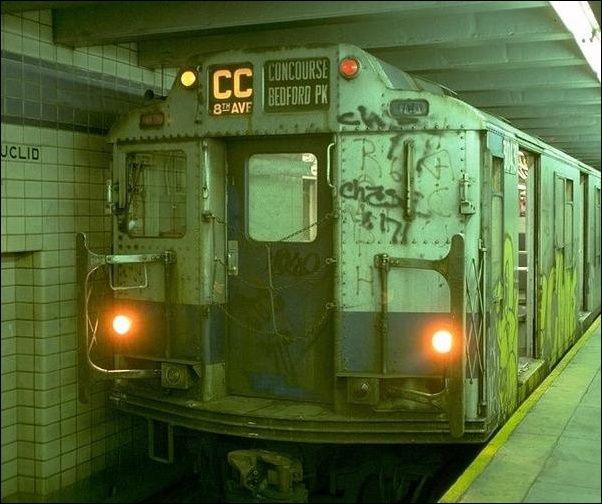 In the subway it also results in much less brake shoe dust, somewhat cleaner air to breathe, and less accumulation of this dust (iron in the majority of the stock) to cause signal failures, short circuits, and fires due to accumulation of it on car underfloors. In freight railroading it not only saves brake shoe wear but on mountain grades saves much fatigue on car equipment, mostly due to hot wheels. Dynamic braking was by far the major improvement introduced by the R10's. It was nothing new; it had existed over half a century earlier and in the Milwaukee Road electrified zones it was made regenerative, that is the motors became generators and fed power back into the wire; thus a train going downhill could help generate power for another train to simultaneously climb upgrade. Unfortunately, however, commuter rail equipment dissipates energy generated by dynamic braking through grids, the same way it is done on diesel locomotives. So when that burst of hot air comes up from under the train when it stops you will know that much of it is from the waste of electricity generated by dynamic braking. Most unfortunate that they haven't figured a way to recycle it in these applications of the system, in these days of high energy costs. Interior of an R-10. Even with fluorescent lighting they were gloomy. The small fans offered little relief from the heat in summer. One more innovation on these cars was the use of roller bearing axle journals rather than friction bearings which were brass bearings lubricated by the axle turning in a reservoir of oil. These roller bearings had already been in use for several years on passenger equipment of mainline railroads; they became standard on the New York Transit system with the R-10 order, however it wasn't until 1968 that they became standard on freight equipment by government order. The sealed roller bearing units require virtually no maintenance as compared to the old friction bearings which needed much attention, oiling mostly. Roller bearings occasionally fail but whereas "hotboxes" used to be a common occurrence they are rare these days. We have gone into so much detail on the R-10 car mostly because it was the basis for all equipment up to and including the R42 class of 1969, and also for the newest cars being delivered. Couplers on the R10 were virtually identical to the R1-9's couplers, and would be used for years to come on other stock, as was the control system, with modifications, of course. Door controls were the same outboard trigger controls as used on the R1-9, and the door engines were the same pneumatic ones as used on the R1-9's. However the starting signal, or motorman's indication light circuit was interlocked with the motorman's controller so that power could not be applied to the motors with doors open. In case of failure of the signal this could be overridden. A smaller improvement was that tail lights would change from red to white when the reverser was placed in "forward" and vice versa when it was centered. In later years headlights would take the place of the white running lights. Already a quarter-century old, an R10 poses at 80th Street on the former Fulton St. El line, in service on the "A" train. 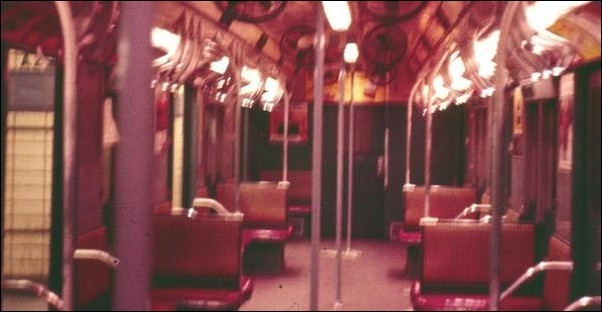 The MTA colors were the fourth color scheme the R10's wore. 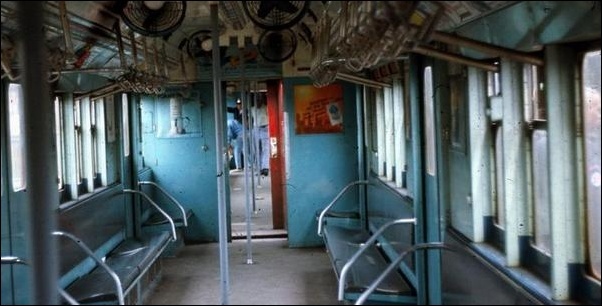 For passenger amenities, the R10 and its cousins were inferior to the older stock until the advent of air conditioning on the system 20 years later. The R10's were noisy, dimly lit even with fluorescent lighting, and were hotter in summer. Outside of these faults, with some modifications made due to mechanical oversights shortly after their delivery, they have been a successful and reliable piece of equipment on the system and have served for many years, nearly equalling the life span of many of the prewar classes of equipment. There were 400 cars of the R10 contract built by American Car and Foundry Company in 1948 and 1949. Until 1976 they provided nearly all of the service on the IND "A" line where they had been initially placed in service. Some of them did a brief stint on the BMT in 1955 but they were almost exclusively used on the "A" train of jazz fame until due to aging they were placed on the part time CC route and also on the GG line; by late 1977 they were off the "A" line. Many have been scrapped, and they are as a lot reaching the end of their career, but they must be remembered as a historic car on the system and having served well. In 1949 the Budd Company, a pioneer in production of stainless steel railway cars, delivered ten cars to the Transit System under contract R-11. These were ultra modern in many respects. Not only were the interiors made to look futuristic, but a public address system was included as well as germicidal lamps. Interiors had false ceilings and forced air ventilation. Braking and propulsion were similar to that of the R10's, except that disc brakes were used rather than the conventional wheel tread brake. In appearance they looked much like what was common on big railroads, but would not be a standard look on the subway in New York until 1964. Door controls on these were the same as on the R10 but electric door motors were used in place of the pneumatic type. Three-car R11 train on the Franklin shuttle in the early 70's. Even after rebuilding they were consigned to this dead end run. After their initial appearance on the system and normal usage they were found to be less than satisfactory. They were downgraded to part time service and often mixed with R16 equipment on the BMT eastern division. In 1964 they were rebuilt under contract R34 at a cost of $50,000 per car, nearly half the price of a brand new car. Circuit breakers replaced fuses in control panels, new axiflow fans were installed, and fiberglass seats replaced the original rattan seats. They were still not very good for operations, and ended their days on the Franklin Avenue shuttle of the BMT. The one thing they had going for them was their stainless steel sheathing which despite its higher cost would more than pay for itself over the years. Why it took until 1964 for the system to adopt stainless steel car construction as standard apparently has never been answered. In 1949, on the heels of the delivery of the R10 cars, a smaller version of the R10 was to be delivered for use on the IRT lines which by reason of closer clearances required smaller cars. These would also be built by American Car and Foundry Company, and a total of 250 cars would be built under contracts R12 and R14; these would be known for their careers as the R12's. Where the R10 was built to the IND R1-9 dimensions, the R12 would be built to the same dimensions as the old IRT stock, namely 51 feet in length and 9 feet in width, approximately. Major differences from the R10 also included different seating, viz. all longitudinal seats as compared to combination longitudinal and transverse seats as used on the R10, and three sets of side doors rather than four as on the R10, and a slightly different window arrangement. Electric door motors were employed on the R12 rather than pneumatic; this was to become a system standard from that time on. Unfortunately the outboard, trigger type door controls were still used on the R12 cars but this was the last order of new cars to get them. A lone R12 heads a mixed train of postwar IRT stock on a 7th Ave. Express, southbound at Gan Hill Read. Rails of the express track are shiny because thru express service ran here in those days. When these were placed in service on the Flushing line of the IRT the old Steinway cars were sent to the East Side local run to supplement the existing fleet. None of the old IRT stock was replaced by the R12's. The R12's must have been a radical change for Commuters on that line who were used to the old IRT stock of 1915-1925 vintage and only a few years before had been riding wooden elevated trains as well. 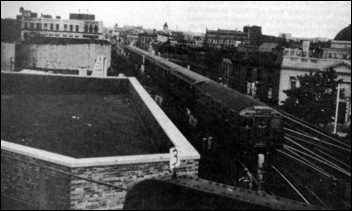 By this time the Astoria line had been given to the BMT so the Flushing line was the sole IRT domain in Queens. 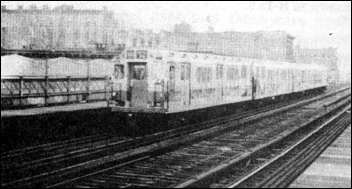 The R12 and 14 cars served exclusively on the IRT Flushing line until early 1964 when then then new R36 cars replaced them in time for the World's Fair. They were then transferred to the East Side and West Side IRT routes, along with the R15 class, to replace the last of the old Low-V and Steinway cars which were still in occasional use on those lines. Where they had operated in solid trains of their type in Queens they were now mixed in with 1955-1964 era equipment and appeared rather strange mixed in with their odd roof design among arch roof cars. 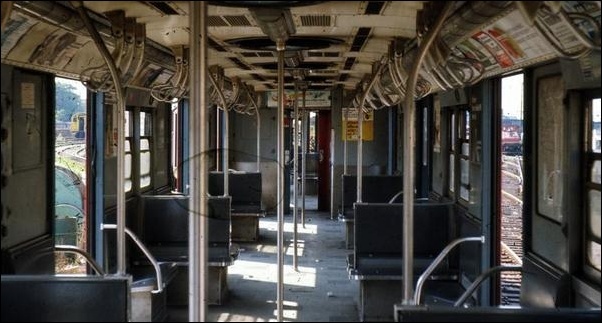 This was the interior of the IRT version of the R10! Hard fiberglass seats had replaced the rattan cushions that this R14 car had when new; only poles were provided for standees when R12, R14 and B15 cars were built. Were Bronx passengers shorter than their Queens counterparts? 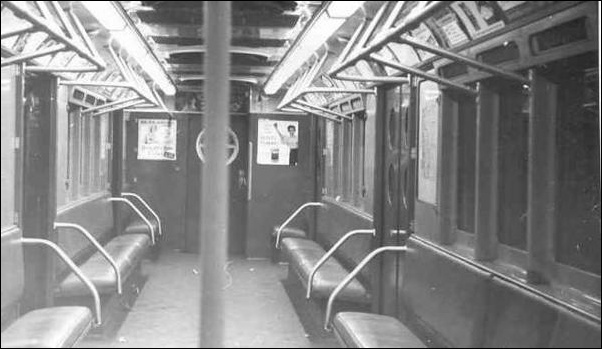 The diminutive handholds mounted on standee poles were added when these cars were transferred to Manhattan and Bronx routes. They have remained on the Lexington and Broadway-7th Ave. lines since they were transferred and with the exception of some in work service are just about at the ends of their careers, which have also been relatively successful. In 1950 another 100 new cars were delivered to the IRT for service in Queens. These were also built by American car and Foundry Company and were known as R-15's. They were mechanically nearly the same as the R12's but in appearance were markedly different. The major mechanical change on the R15 was the placement of the conductor's door controls in motorman's cabs. The motorman's cab at the head end of the train was of course the only one in use while a train was on the road so these controls at the conductor's position could be used by the conductor. This was certainly an improvement in the conductor's lot: they would not be required to mount steps between the cars and operate the doors from this hazardous location, on this type of car. The cab operation may not have offered as much visibility but reduced other hazards. Controls on these cars were lever controls which would be used on several hundred more cars to follow. A key was required to operate them; this would enable the conductor to leave his position for brief periods without fear of vandalism and tampering with door controls by unauthorized persons. A train of R15's running thru Jackson Heights on the Flushing line about 1960. These were undoubtedly the best styled of all cars built for the system in the 1950's. In styling the R15 was a big change from the R12. Windows were the same, side doors had portholes rather than rectangular panes, and seats were of a leatherette material; rattan seats would no longer be used on new cars built for the system. Arch rooves were used on the R15's, for the first time on New York City Transit System rolling stock. The R15 also had false ceilings and forced air ventilation by Axiflow fans, a first for the system. In this respect they were a standard bearer for cars to be delivered until the advent of air conditioning but their body style was not to be repeated. Their history of operating assignments and present disposition is the same as that of the R12 and R14 cars which immediately preceded them. They also will soon be a matter of history as new Japanese built cars are delivered to the system. In 1954 another new car design began to appear on the system, a design which would be the most duplicated body style ever to appear on the New York rapid transit lines. It was not exceptionally attractive but nonetheless was functional and practical. Nearly 2300 cars of this style, with minor modifications, were to be built for service on the IRT lines, and following the first 200 of the BMT version, another 550 cars of this body style were later to be built for BMT-IND service. Other than for differences in dimensions, door and window locations, there were over 3000 duplicates of this 1954 design in service by the time stainless steel cars were built for the system, and it would be safe to say that this was the largest group of similar-appearing passenger cars anywhere on the North American continent. The first order of these cars was for the BMT division, 200 cars of class (or contract) R-16 built by American Car and Foundry Company thru early 1955. These were actually BMT-IND cars as the dimensions of new BMT equipment were not to follow the old BMT standards but used the dimensions of the pioneer IND Rl-9 classes. 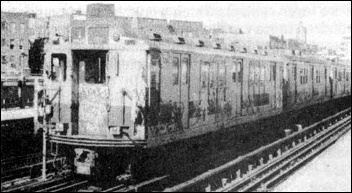 The R-16's were placed in service on the BMT's Eastern division, serving mostly on the Jamaica elevated line but also filling in at times on the 14th St-Canarsie Line and Myrtle-Chambers line when cars were available. They did not result in the retirement of any of the BMT standard "steels" that were used on that line prior to their delivery of the new cars, but freed them to fill a car shortage on the BMT Southern Divison, and to retire some wooden "El" cars. Last stop in Brooklyn! Marcy Ave., in Wiliamsburg on the Broadway-Jamaica el. A train of R16's will soon cross the Williamsburg Bridge for Manhattan. Only eight minutes of this run, presently known as the "J" line is in subway! After leaving Manhattan the rest of the run to Jamaica is outdoors. The mechanical aspect of these cars pretty much followed established patterns, the major change from the R-15 class of 1950 was in the control apparatus units on the General Electric cars (most contracts split orders for electric equipment between General Electric and Westinghouse Electric.) The General Electric system used enclosed resistance grids cooled by forced air, hence the sounds of whining air while these cars were accelerating. This was an unfortunate type of system, having been used in 1100 IRT cars which followed these, but happily this system was not duplicated after the R-22 cars were delivered. Another major improvement was the inclusion of public address systems on the R-16's; they never did sound very good however, and worsened over the years. The first decent PA system did not appear until 1966 on the system. Interior of an R16. Seating pattern copied that used on R1-9 and R10 classes; this would be laid aside on future orders until the R44's were built. Hard fiberglass seats have replaced vandal-prone foam rubber (see IRT R22 interior photo). The interiors changed slightly in the early 70's when new door motors were installed, and panels next to the doors bulged out a few inches toward the ceilings. The body styling of the R16's and its progeny was somewhat reminiscent of the New York Central's multiple unit suburban cars of 1950, simply thought of by the author as bland. With riveted construction and a little huskier details they might have looked like classics from the 1920's even with arch roolves, but by the 1950's welded construction had already made its inroads. The bodies were of sheet steel, painted in the classic Pullman green color. (on the R-16 anyway; other contract cars would appear in maroon and bright red also). Windows were just placed in plain rectangular cutouts, ironically enough double hung windows with opening upper sashes and fixed lower sashes had now reappeared after an absence of 15 years for installation in new cars. The end door had porthole windows rather than rectangular, this however was copied from the earlier R15 cars. Side doors again had rectangular windows with rounded corners as on the R-10. The R16 was the heaviest 60 foot car ever built for the New York City Transit system, weighing in at some 85,000 lbs, heavier even than the classic old R1-9 cars. The weight figure has since been eclipsed by the 75 foot cars built in the 1970's but then again these were longer cars, and the old IRT had 51 foot cars (Gibbs cars) that outweighed these. The R16 certainly doesn't rate as being the system's star performer. Although they reduced running times on the Jamaica el when new they certainly didn't stand up long as fast rolling stock, nor were they very reliable in other aspects. 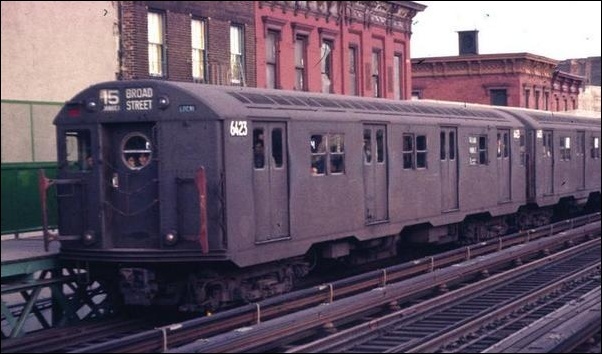 When there were heavy snows these cars were placed on mostly underground routes and the gallant old A-B, or standard steel cars were run on the Jamaica line. In late 1967 these cars were transferred to the subway routes, replaced by somewhat newer R27 class cars on the el. Before we go into further history of these cars it will be mentioned that when the former Long Island Railroad Rockaway Line was reopened by the Transit Authority in 1956 for rapid transit operaton that the R16's served for a while there and on the IND "A" line. 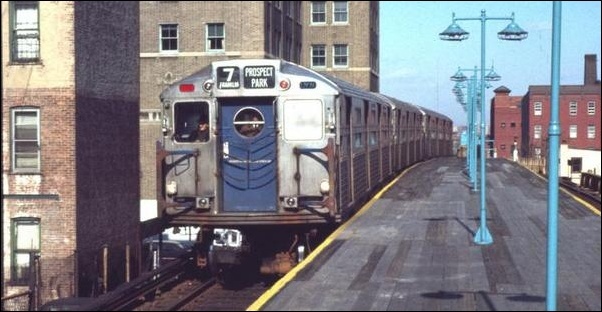 However the old R1-9 cars were superior there and returned to reign supreme in the Rockaways until the late 1960's. After being transferred to Queens service on the IND the R16's served on the now defunct EE line and the GG line. During their service there they received new door engines, similar to those used on the much newer R44 cars. 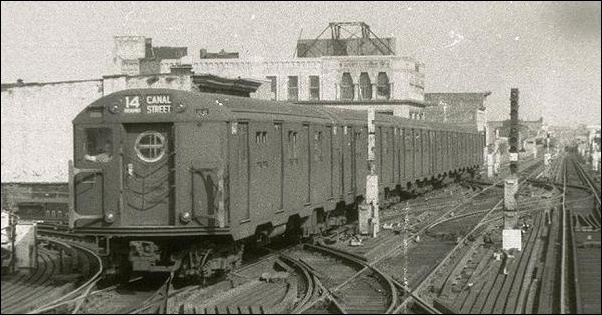 However they were still slow cars and not most dependable; they were sent back to their old turf on the former BMT Eastern division beginning in 1976; they then replaced the last of the aged R9 class cars on the 14th Street-Canarsie line which for decades has seemed to be the home for oddball and aging equipment. 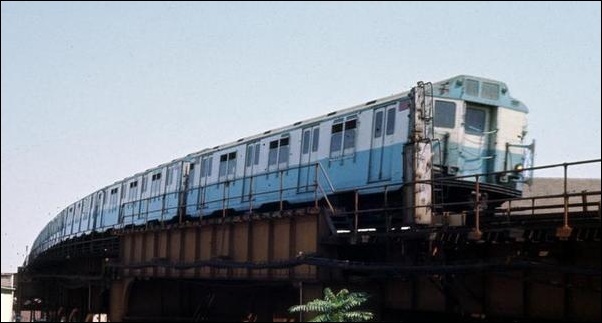 The R16's also found their way back into service on the Jamaica elevated line which was their first home, to serve along with newer cars there on a part-time basis. By the summer of 1977 there were many R16 cars in storage while the older R10's were having the end of their heyday. Presently all of the poorly performing GE cars are out of service and many R16's have already met their end. As new cars for the B division (former IND and BMT divisions combined) are expected to be ordered in the near future all of this class will no doubt be retired. R11's on the Broadway-Brooklyn elevated in 1956. This view was at Broadway and Myrtle, taken from the upper level Myrtle Ave. line platform. A train of R12's arrives at 156th St. on the 3rd Ave. line on the day this last section of the old Manhattan el lines, albeit in the Bronx, was in service. April 29, 1973. First trains over this line in the 1880's were steam-hauled wooden coaches. 1949-built R12's were the last. These too will soon be history! R14 car heads another mixed IRT consist on the Broadway line. This train is painted in MTA colors, shared with graffiti. Train is currently "laid up" awaiting a time of heavier traffic. Franklin B. Roberts.